Weve all experienced it before  youve beentexting/chatting with a new guy or girl for a few days or weeks and suddenly, you realize youre becominginterested in them. It can seem like a hopeless situation when you arent the slightest bit sure if they feel the same, but stay calm! 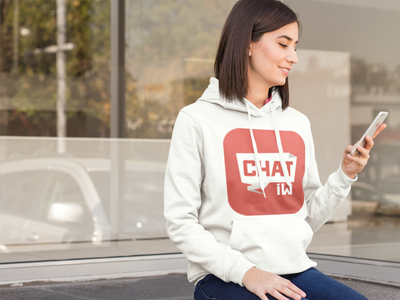 By knowing the rules of chatting and playing it right, you can soon find out. Here are four fantastic tips to upgrade your chatting relationship to a dating one. Making good conversation is the key to successfully maintaining any text or chat-based relationship. It doesnt matter how attractive you may be  if youre boring, then it wont last. Do you only answer to questions asked, and not ask any in return? If so, youre doing this chatting thing wrong. Everyone likes to be asked things about themselves, whether its how their day was, what their favourite food is or what theyre thinking about. Being fun and creative with your conversation can earn you big points in that guy or girls eyes. Using emojis in a chat can take a simple sentence from average to funny, dramatic or flirty, and your chatting partner is guaranteed to be much more interested in speaking to you and getting to know you better. Heres one of the most important rules of taking chatting to something more: dont rush things. Though taking things too slow can frustrate your partner, taking things too fast is almost always a surefire way to turn them off completely, destroying your chances with them. Asking to meet up, asking for phone numbers and asking for pictures within two weeks of beginning to speak to someone can send them running if theyre not yet comfortable with you. Instead, take the time to learn the person youre chatting with. Focus on getting to know them for who they are, and learn to be genuinely satisfied with this. This way, when the time comes and you two are both ready to meet up or trade pictures, it will be natural, comfortable and much more meaningful. For some strange reason, society often dictates that males are supposed to initiate things: proposals, dates, and yes conversation. However, whether youre male or female, you can be the one to start the conversation at any time. Whats more, messaging first does more than just start the conversation; it shows that youre making effort and are interested, which can be the deciding factor in whether your girl or guy chooses to give you a chance. Though this is last, its definitely not least. In fact, being yourself is the most important item on this list for one basic reason: none of the other methods will matter if you dont pay attention this one. Being interesting, taking things slow and messaging first all mean nothing if youre faking it. If the person youre talking to doesnt seem to be your type, dont change yourself to fit them. Keep it casual and move along  youll find someone who youre compatible with in the blink of an eye. If youve been struggling with taking your relationship with that girl or guy to the next level, these tips are definitely for you. By changing the way you approach chatting, you to become more approachable, desirable and most importantly  dateable.